World Bank President Paul Wolfowitz has called on leaders to push for agreement on a deal to free up global trade at the forthcoming G8 summit in Russia. In a letter to leaders of the top industrialized and developing nations, Mr Wolfowitz warned that "time was running out" for a deal to be reached. Long-running negotiations on a trade deal have so far failed to bear fruit. Leaders of the world's richest nations are preparing to meet in St Petersburg for the G8 summit this weekend. They will be joined by leaders of the so-called +5 group of major developing nations - China, India, Brazil, South Africa and Mexico. 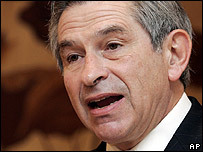 Mr Wolfowitz urged leaders at the G8 gathering to work towards a compromise on the thorny issue of global trade. "Our collective efforts can make the difference," the World Bank president wrote. "We can work to lift millions from poverty, boost developing country income, improve global market access and reduce taxpayer and consumer costs for all, or allow the whole effort to collapse, with harm to everyone. "A collective pledge by the US to reduce agriculture subsidies, by the (European Union) to improve market access and the +5 members to limit tariffs on manufactures... could help seal a deal." Mr Wolfowitz's comments come two weeks after trade ministers meeting in Geneva failed to pave the way for agreement in their latest round of trade talks. Poor nations argue that the world's richest countries must open up their agriculture markets and end farm subsidies before they open up their manufacturing and services markets to global competition. Mr Wolfowitz told leaders who will attend the summit, which officially begins on 15 July, that full trade liberalisation could potentially generate $300bn a year in additional global economic production. "The world's poorest people, the 1.2 billion living on less than $1 a day, are counting on your good intentions being transformed into decisive action," he wrote. The G8 is made up of Canada, France, Germany, Italy, Japan, Russia, the UK and the US.